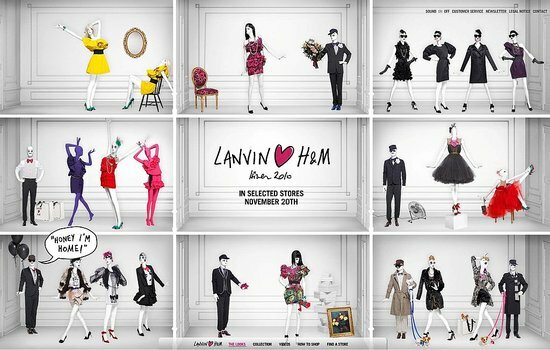 Last Tuesday, the 23rd of November, the world waited in suspense for the opening of the Lanvin collaboration with high street retailer, H&M. Thousands sat astute at their laptops, yawning at the 6.50am clock, waiting for the website to switch from 'This collection can be bought from 7am on the 23rd November' to a more exciting 'Buy online right now!' whilst thousands of people, all over the UK, alas, all over the world, waited for their chance to burst through the H&M doors at 9am. The collaboration had been promoted for months previous, leading to a consumer frenzy when the days grew closer. The exclusivity of owning a Lanvin dress is given only to those who have over £2000 to spend on a designer dress, yet this collection was designed as a way for the public to get their hands on a Lanvin piece for under £100, hence the frenzy. The womens collection consisted of couture inspired dresses and skirts, sophisticated jackets, cute abstract t-shirts, stunning stilettos and accessories, all for under £150. For those who love fashion, it was something to be excited about. For H&M and Lanvin, it was obviously going to be a huge success, and something that needed to be managed and organised correctly. For the most part, H&M should be given credit for the organisation and management of their stores, yet, their online services left much to be desired. Not often am I one to look negatively upon H&M nor online retailing as a whole. The retailer never fails to deliver on trend, fashionable clothing at lower prices that match the quality of their garments. Online retailing is my channel of choice when shopping, call me a convenience shopper, or just plain lazy, but I prefer it hands down. However, the dissapointment I felt last Tuesday morning at the hands of both H&M and their online retail strategy ushered me to write about the saga. I understood that the site would be popular, and the site would be overly crowded and of course I didnt want to miss out, so as instructed, i tried again. and again. and again. Refreshing the page for 30 more minutes until finally I managed to access the site. The majority of stock, of course was already gone, yet to my extreme excitement, the Lanvin T-Shirt that I wanted alongside some heels, a dress and a skirt that I had previously chosen, was still in stock. I quickly rushed to put it in my 'shopping basket'. You can imagine my mood. I again went back to twitter, and others were reporting that their products had also gone astray, yet much to my annoyance and disbelief, there was no communication coming from H&M directly. There was no, 'Were sorry that the site is broken', 'the site is overcrowded, please keep trying' or any reassurance of any kind. 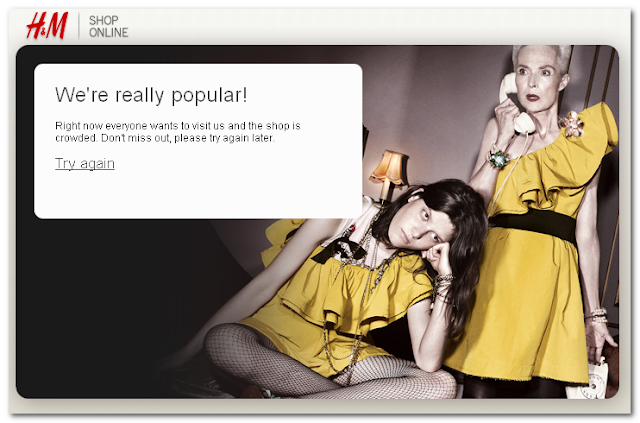 H&M had forgotten their online consumers in their quest for record sales. I understand that not every site can bear the weight of thousands of individual users, searching and purchasing from a range of 50 items. Yet, H&M should have had technicians on site, working at the functionality of the site throughout the entire process. Such a massive event, called for a massive amount of man power. If there was nothing more they could do on the site, they should have then reverted to their portals of communication, i.e. their facebook, twitter, blogs etc and apologised, reassured and sympathised with their upset, loyal consumers. It was this lack of communication, almost as though the H&M staff had left their head office for a coffee, that really got under my skin. With such an influential and direct communication portal as social networking sites, the situation could have been smoothed over within minutes. This should add as a lesson for every retailer. If you are going to create a media sensation, then make sure you have the tools to deal with the uproar. Put in place a robust website, with the ability to hold high amounts of traffic. Make sure every link on your page is working perfectly, before and during the launch of any event. And mostly, if the worst does happen, make sure you utilise your cheapest and easiest methods of consumer communication. Relationships with consumers is the backbone of your company, do not take it for granted. A few polite words is enough to reassure your consumers that you are trying your hardest to make them happy. As my eyes opened wide, I spotted the black stiletto heels that I had tried to buy as a Christmas present, and in some heavenly way, they were in my size. The last pair of heels in my size possibly in the whole country, and they were sat within my reach, just waiting for me to buy them. And buy them I did, faster than you can say Lanvin and H&M. H&M had put a smile back on my face.